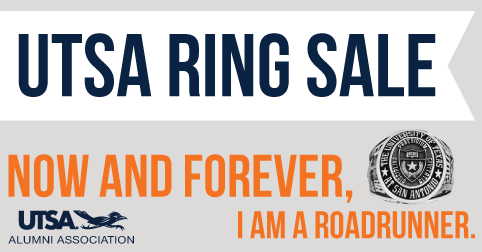 Celebrate your academic achievement with the official UTSA Ring! The UTSA Ring serves as a symbol of pride and accomplishment. It forms a common bond between past and future graduates. 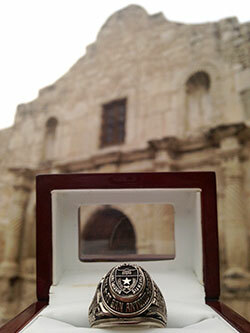 No other single item replicates the uniqueness of UTSA the way the official ring does. The ring is reserved exclusively for those who have earned the right to wear it. This lasting symbol of UTSA is limited to juniors, seniors, graduate students and alumni. Choose your ring online today! Monday - Friday from 8:00 - 5:00 p.m.
Monday, March 18, 2019 | 10 a.m. - 7 p.m.
Tuesday, March 19, 2019 | 2 p.m. - 6 p.m.
UTSA Rings sleep in the Alamo the night before Ring Ceremony. Receive your official ring in the presence of your friends, family and university dignitaries at the UTSA Official Ring Ceremony held each semester. This prestigious occasion, held in the H-E-B University Center Ballroom, UTSA Main Campus, marks a milestone in your academic career. Ceremony participants will receive their ring in a beautiful keepsake box, an exclusive for ceremony participants. A reception immediately follows the presentation where you can celebrate your achievement. All eligible ring recipients will receive an invitation for the presentation ceremony at least three weeks in advance of the event. Attendance is free for ring recipients and their guests. The university seal atop this classically styled ring distinguishes a UTSA graduate from all others. The motto “Disciplina Praesidium Civitatis” is the Latin translation of “A cultivated mind is the guardian genius of democracy,” a quote by the Republic of Texas president, Mirabeau B. Lamar. The images on the seal symbolize this motto. The shield stands for protection. The open book depicted on the shield signifies higher learning. A star and wreath, adapted from the seal of the State of Texas, complete the seal. The star represents the Republic of Texas, and the wreath depicts an olive branch, a symbol of peace. One side of the ring features the contemporary architecture of the sombrilla, a landmark of the northwest campus. It is a place for students to congregate and friendships to grow. Rowdy, the UTSA Roadrunner mascot, signifies the spirit and tradition of the university. Native Texas plants – bluebonnets, the state flower, wildflowers and cacti – represent the Southwest. The other side of the ring pictures the Alamo, San Antonio’s most famous attraction. The words wrapping around the image – “From our hills of oak and cedar to the Alamo” – are the opening of our alma mater. The words represent the growing university; the trees lining the northwest campus and the Alamo representing the downtown location. Images of oak and cedar branches solidify the connection. Combined, these images create the official UTSA ring, which reflects the prestige of the university and the graduate’s successful fulfillment of the university’s high academic standards.